Maverick Egg Cooker/Poacher This handy portable egg cooker is a neat and easy to use way to cook your eggs. Just use the included measuring cup to put a very precise amount of water into the stainless steel and plastic base. Turn it on with the lighted on/off button and it boils and steams away the water, then shuts off and buzzes to alert you. More water, more cooking time. Less water, shorter time. The measuring cup has all the markings needed on its clear sides.Two trays are included, one for up to 4 hard or soft boiled eggs, and one for up to three poached eggs. 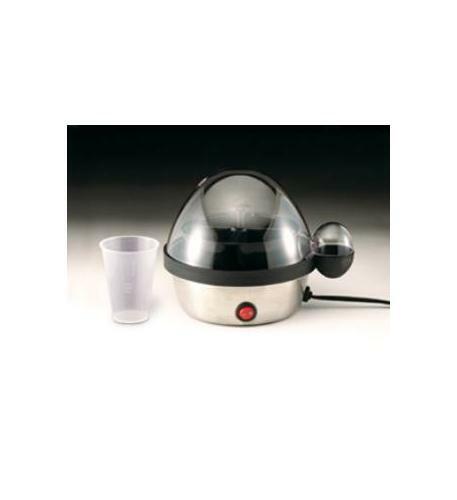 Hard or Soft Boil up to seven eggs in one inner tray Poaches up to four eggs with included 2nd tray Stainless Steel base and boiling liner Egg shaped body features alarm buzzer when eggs are ready Includes a water measuring cup for perfect eggs every time Size approx. 6" diameter, 6 1/2" height. 120 Volts, 400 Watts.